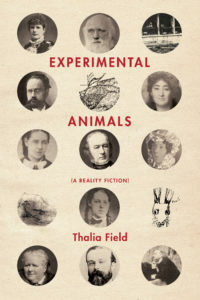 In her forthcoming novel, Experimental Animals: A Reality Fiction, Brown professor Thalia Field accomplishes several remarkable things. Experimental Animals is, partly, the story of Claude Bernard, a 19th-century French physiologist and vivisectionist who introduced the scientific method to medicine, and his disastrous marriage to Fanny Martin, an animal rights activist avant la lettre. On a larger scale, the Bernard marriage represents cultural riffs about the ethics of using animals in the laboratory—issues that obviously have not been settled. Experimental Animals (Solid Objects | November 1) is a study of the history of science, a modern novel of animal activism with roots in the Victorian anti-vivisection novel, told almost entirely in the words of real people. With the exception of Fanny, every word is drawn from letters, pamphlets, newspaper articles, and other writing of the time. This is a massive feat of research—20 years and hundreds of thousands of pages—and of translation (from French) by Field. This is an exploration of what realism and experimentalism means now—and in the past in the hands of writers such as Balzac and Zola. At the time, scientists and activists on either side of the issue of lab experimentation martyred themselves—they saw their lives as something to give away to a larger issue.